WSBK Nürburgring – Qualifying Practice 2 & Superpole. Saturday, 31st August 2013. Weather conditions: Overcast with rain in the afternoon. Front row at the home round: The BMW Motorrad GoldBet SBK Team put in a strong performance at the Nürburgring (GER) today. Factory rider Marco Melandri (ITA) qualified second on the grid with his BMW S 1000 RR in this afternoon’s Superpole qualifying. His team-mate Chaz Davies (GBR) was fastest in both qualifying practices and finished seventh in the Superpole. Thus, he will start the tenth round of the 2013 FIM Superbike World Championship from the third row. Today, the riders and teams had to deal with the typical, unpredictable, “Eifel weather”. The day started overcast but dry. Chaz set a dominant fastest lap time in this morning’s second qualifying practice, more than four tenths faster than his closest rival. Marco improved from yesterday to seventh position. Just a few minutes before the start of the Superpole, it started to rain. The session was declared “wet”, meaning that there would be two twenty minute sessions. Both BMW factory riders made it to the second and deciding part. Marco was putting in one fast lap time after another and was leading the timings most of the time but dropped back to second when Ayrton Badovini (ITA) improved his time in the closing stages to take pole position. Chaz was lying in fourth but dropped back to seventh at the end. As he fell during his final attempt, he could not improve his time. In the FIM Superstock 1000 Cup, Sylvain Barrier (FRA) from the BMW Motorrad GoldBet STK Team secured his sixth pole position of the season. 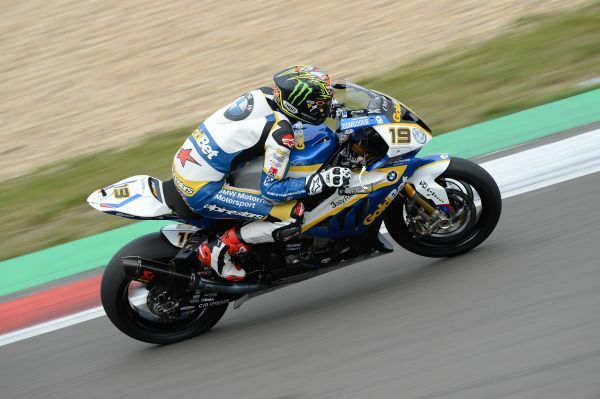 In today’s deciding second qualifying practice he set a new lap record with his BMW HP4. His team-mate Greg Gildenhuys (RSA), who is racing at the Nürburgring for the first time, qualified ninth in the field of 26 riders. “Today was a very good qualifying session, I’m really pleased. Until the end I tried to get the pole-position. A few minutes before the end I rode a bit slower to cool the tyres down and to try a new flying lap, but it didn’t work because there was not enough water on the track. “The second qualifying practice was good. I surprised myself a little bit with my lap time. I obviously knew it was fast but I did not expect a low 1:54 on race tyres and I think it was already the fourth lap on that tyre so I was quite happy with that. “It was a good day. We solved the issues Marco experienced yesterday and he was so close to getting pole-position. Marco is very happy and confident for tomorrow. He will start from the front row for the first time this year and he’ll for sure try to have two great races. Chaz struggled a little in wet conditions; otherwise he could have been on the second row. But he has a good race pace and he’s able to start very well, so we’re confident for tomorrow’s races. In the Superstock Cup, Sylvain retained yesterday’s provisional pole-position and set the new track record. “We are quite happy with the work done on the RRs today. Chaz has shown an impressive speed on the race tyre. The lap time he did this morning was amazing and he has also further improved his race pace a little bit. But still there is some room for improvement and we will work on it tomorrow morning during the warm-up. 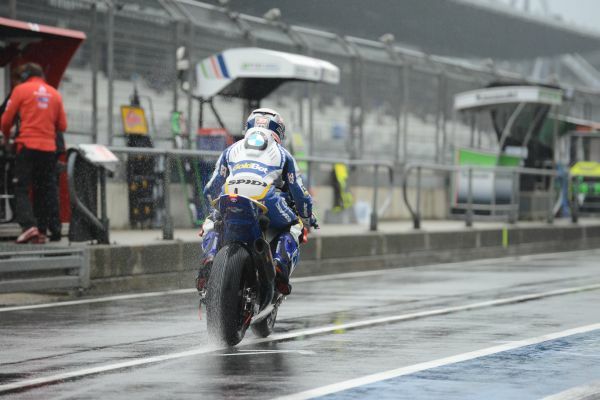 Unfortunately during the wet Superpole he did not have a fantastic feeling with the bike, especially going into the corners. But starting from the third row is not a big issue. We have seen in the past that Chaz is a good starter and I am sure that he can catch up with the front guys and stay with them until the end.